Looking for a Hunters Creek Village painter who you can rely on? Since 2015, Palmer Pro has been wowing local homeowners and businesses in Hunters Creek Village Texas with superior painting services and unparalleled customer service. 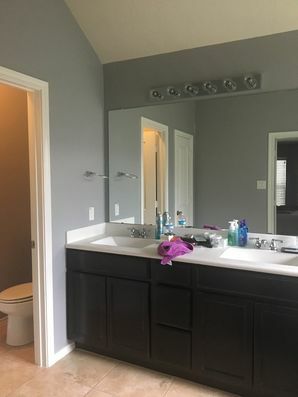 It's tough to find a painting contractor in Hunters Creek Village who can be counted on to get the job done right, the first time. Our mission is just that. To provide a consistent, reliable painting service that exceeds customer expectations every day. Call (832) 410-1868 and find out how we can "wow" you too! There isn't much that Palmer Pro can't paint. From homes to office buildings, exteriors and interiors, we do it all. If you want to refinish your kitchen cabinets as a part of an economical kitchen update, give us a call. We also paint and stain decks in Hunters Creek Village and stain fences and gazebos. Interior walls naturally become dinged and marked over time (especially if you have kids or pets). Palmer Pro can quickly cover them with a fresh coat of paint. Tell us what parts of your home you want to be freshened up, and we can do it! Whether you are moving into a new office or an apartment, want to paint your own Hunters Creek Village house, Palmer Pro can help. Put our 4 years to work for you! Would you like assistance to select colors that will complement your existing decor? Not a problem. With endless options available, we'd be happy to help you select that perfect hue. Once you've chosen the colors and level of sheen, we'll get to work preparing your walls and ceilings to receive the new paint. Careful preparation is the key to a great paint job. All holes and dents will be filled and sanded smooth. Primer will be used to cover existing paint. Last, one or two coats of premium paint will then be applied to your walls. When it comes to house painting in Hunters Creek Village, no one delivers like Palmer Pro. We won't cut corners or rush the prep work. Properly preparing surfaces sets the foundation for a professional, lasting exterior paint job. Exterior surfaces are inspected and any rotten wood is removed and replaced. All exterior surfaces are then caulked and sanded before primer is applied. The final step is the application of premium quality paint. Palmer Pro also stains decks in Hunters Creek Village and fences using the same thorough preparations. Freshen up the exterior of your house or deck and become the envy of the neighborhood! Give Palmer Pro a call today to talk to an expert Hunters Creek Village painting contractor.